In the latest installment of the iPhone-X-sells-bad saga, analysts are rushing to explain that, even though Apple may have cut the Q1 orders for the handset, and is expected to forecast much lower sales numbers for the current quarter, it's all been worth it for the company when it comes to the bottom line. Not only has the iPhone X likely raised the average selling price of iPhones to record heights, which will more than offset the tepid sales predictions, in terms of operating profits, but the notch-y handset has evidently pushed the iOS market share and loyalty way up in important markets. The full results for the last quarter of the year show that Apple’s decision to release three new handsets over a staggered period, including the ultra high-end iPhone X, has been a sound one. With Apple’s existing release structure, expectations would always be that the flagship model would be the top selling device in key developed markets, but with the premium price of iPhone X, real life affordability has come into play. Given that in December iPhone X made it into the top three best-selling devices across all key regions, particularly in urban China where it was the top selling model, the pricing strategy seems to have been vindicated. It's still a flop compared to expactions. Who’s expectations, yours I am assuming or Apple’s. Well seeing as how they only gained beyond the margin of error in the Chinese market only, can't really be a good sign. I mean even the US was a loss in market share and that's their main market. The price and Apples value for its features is below what people are expecting for value. Even Apples supposedly great service is a mute point as well nowadays, especially when Apple charges a ridiculous amount for the repair of the glass back on on the new iPhone 8's and X. $400 for the iPhone 8 plus, really? The iPhone X is over $500 for the glass back. If anyone thinks that it actually costs that much to repair the X, is just an iDiot. Why is it that other companies like Samsung, and others that also sell glass backed smartphones can repair their smartphones for a fraction that Apple charges? Apple is such a greedy company these days. iPhone X repair breakout, $50 for the repair. The other $450 is the cost to bend over and take it where the sun don't shine.. I still don’t get how Apple is still in business considering everything iPhone have been a flop since iPhone 4 launched. Every year we get the same reports about Apple adjusting their holiday numbers and every year the analysts and media makes it world news,. Stock manipulation at its finest. A company that makes $400-500 profit per phone and selling hundreds of millions devices every year is sure manipulating the markets. Yeah, I don't know either how are they still in business. "everything iPhone have been a flop since iPhone 4 launched" Do you know what a flop is? It's because most people are familiar with iOS and it's intuitive. The phones work well, have great selection of apps and get updates for about 4 to 5 years. That's how they're still in business. I wonder why is the percentage of "Other" operating systems growing in some countries. "but a lot of news is suggesting that Apple will report one of their highest earning quarters (Some are saying the highest for the company ever) this week. " Apple already said last q that their prediction for holiday q is highest ever and that's propably exactly what it's going to be. When Apple have estimated their own numbers wrong? Let's not forget Report Claims iPhone X Sales Not as Strong as Expected in the U.S. Poor iPhone X Sales Are Good News For Apple iPhone X sales ‘below’ expectations due to price, says key analyst Analyst suggests customers prefer cheaper iPhones to the iPhone X Apple's combined iPhone X, 8 and 8 Plus uptake still can't beat the 6 and 6 Plus Chinese tech stocks slump after report that Apple has cut its iPhone X orders by 40% The iPhone X order cuts news erase $14 billion off Apple's market cap Interest in Apple's new iPhones near all-time lows at Verizon, AT&T and Sprint What? Ming-Chi Kuo expects Apple to cease production of the iPhone X by mid-2018 due to low demand ‘Disappointing’ sales see Apple cutting iPhone X production in half this quarter – Nikkei :D I thought iPhone X was doing badly in China? So how the share jumped 10%? Considering Kantar's data is purely panel based, I'd take that 10% with a grain of salt. It also doesn't specify which iPhone was responsible even if it did increase by 10% and it's unlikely that the very expensive iPhone X was responsible, it's more likely cheaper older models. I don't see why chinese people suddenly would buy those same iPhones which they could buy long time already. Of course the X is biggest reason. Check from google trends how much higher iPhone X is trending in China than any other iPhone. Because they get cheaper -_- Google Trends only shows how much interest there is in the topic of iPhone X, it proves nothing at all about people actually buying them. Did you skip this article and came directly to comments? "December iPhone X made it into the top three best-selling devices across all key regions, particularly in urban China where it was the top selling model" Kantar clearly said X was best selling in China. Maybe because Apple dropped the price of the iPhone 7 and 7+ by 25% in China. Didn't you read the story? X was best selling phone in China. "December iPhone X made it into the top three best-selling devices across all key regions, particularly in urban China where it was the top selling model"
And they reported all this without a shred of proof, no sales numbers, nothing. 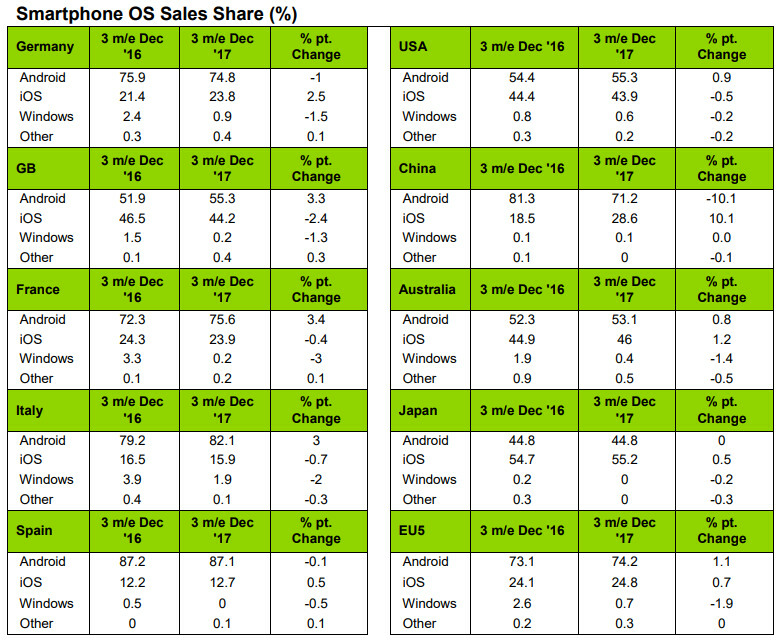 It's all guesswork, they say sales are great and yet IOS % of marketshare is still falling. More bad news for you https://www.counterpointresearch.com/apple-sells-record-22-million-iphones-usa-4q17/ Apple Sells a Record 22 Million iPhones in USA During 4Q17 "since its launch on November 3rd, the iPhone X outsold the iPhone 8 and iPhone 8 Plus by a 2:1 margin . " "Apple was able to grow their sell-through market share from 37% to 44%. This is the highest ever market share for Apple in its home market."